In a day and age where we're constantly hurrying to and from obligations, events, and appointments, it is more important than ever to really feel the true meaning of the holidays. It's a time in life where you have a great chance to sit down with your child and teach them what makes the holiday season truly special. It's so easy for our children and us as adults to lose the holiday sentiment in all the errands, and running back and forth that we do at the end of the year - scrambling to find the best gifts, spending time with all of our in-laws and decorating our homes. The holidays are a time for peace, love and kindness, so why not make it a priority to teach our children the best way to fill the season with meaning. They're nostalgic times where we can slow down and remember how much the people in our lives mean to us and do kind things to show them. Keep reading for some of the best tried and true methods of spreading holiday cheer and teaching little ones about the holiday spirit. After a recent separation, the holidays can be very hard, but there are ways to work with your co-parent create a special holiday season for your children. If it's at all possible to spend a little time with everyone together, try to. It's important to show your little ones that even though you aren't together, you are still a unified team that says kindness is important and valued by both of you. If getting together is not an option, try making time to discuss how you would like to teach your children about the kindness and cheer around this time of year with your co-parent so you're both on the same page. There are a multitude of holiday activities you could do together, but separately. Try participating in Operation Christmas Child. You and your children could pick out a few toys and non-perishables to send to a child in need. Then, when your children visit your co-parent, they could pack and decorate the box with them. That way your children can have a sense of teamwork and a lesson in kindness. If it's not possible to schedule any holiday time with your co-parent this year, try suggesting that or helping your children craft a nice card or arts and crafts project for him or her. It's a nice way to include them in your holiday plans, and show your children that you both care for one another. In all the hustle and bustle of daily living, we can start to take many things for granted. Hot meals, warm clothes, and entertainment are a luxury for many. Do exercises with your children to teach them to identify the things in their lives that can be shared with others. For example, the hot stew leftovers that would normally be thrown away or saved for another day's dinner can be packaged up and shared with your co-parent. This will show your child that kindness knows no bounds and they will begin to understand how nice it feels to help others. Encourage your child to pick out the toys that he/she no longer plays with and let them choose a local charity to donate them to. Let them snip some flowers from the garden and have them pick a few neighbours to share the beauty with. Encourage anything that will show them that it isn't simply about giving gifts, but the act of sharing what you have with someone else to be kind and spread cheer. Make doing charitable acts the center of the holiday season by devoting a little time every day to spreading cheer and kindness to others. 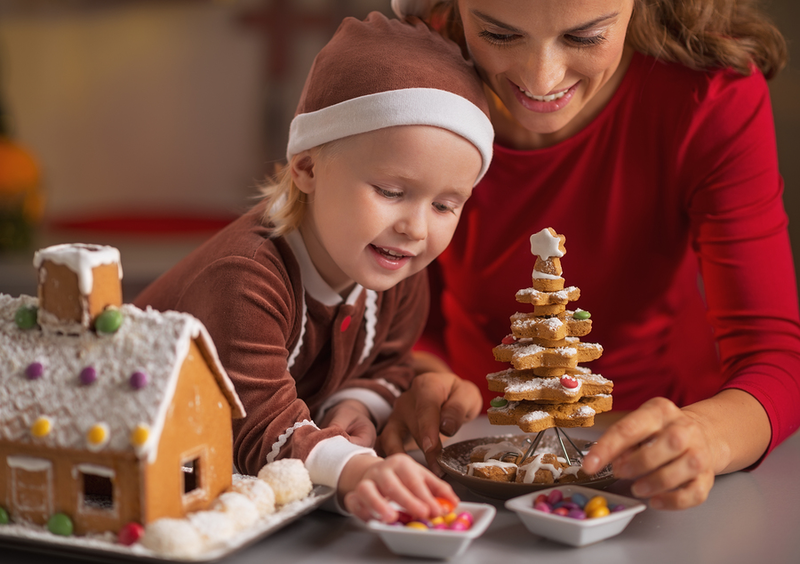 Bake treats over the holidays and have your child make a list of some of the people that may appreciate receiving a thoughtful baked goody, such as an elderly neighbour, the mail man, or the children at the local children's hospital. You and your co-parent could each spend time handing them out with your children. Other calendar events can include shovelling the sidewalk of a neighbour, writing and decorating a card to a soldier, bringing supplies to a local pet shelter, or delivering candy canes to the men and women who serve our communities as police officers, firefighters, and medical staff. Let your child take the lead and find people in need of help in everyday situations. When entering the grocery store, ask your child to spot someone who could use help returning a cart. Allow your child to help someone carry their groceries, or encourage your child to pick random strangers to smile at and greet. There are endless ways to cultivate kindness while running daily errands and performing otherwise monotonous tasks than can last well past the holidays. Sit down with your child and help them write letters of thanks to the people that are most important in their lives – especially your co-parent. Not only will this foster a great relationship between your child and the co-parent, but it will also show your child that you respect and care for your co-parent. Other letter recipients can be grandparents, class friends, neighbours, babysitters, teachers, or bus drivers. Each letter should describe what your child values about each person. They will make someone's day and get your child thinking about the importance of showing compassion to people in his or her life. There are a number of holiday stories out there that can teach powerful messages in exciting and interesting ways. When your goal this season is teaching kindness and compassion, there are books to compliment the message you're trying to teach. Some examples include The Bernstein Bears and the Joy of Giving, The Polar Express, and An Orange for Frankie. The act of reading with your child not only gives you quality time together; it is also a great addition to your child's kindness curriculum. Advent Calendars are a great way to implement holiday cheer all month long. They usually cover the month of December and feature little boxes or windows with quotes or tiny gifts. Try to find one (or make one together if you have time) that focuses on a new act of kindness each day. It's a perfect way to keep the holiday spirit momentum going with your busy lifestyle and inspire your child to show his or her compassion. You can set the calendar up and let your child explore a new window each day without any daily prep! In a season that focuses on generosity and cheer, take advantage of the teaching opportunities that can be instilled in them for years to come. It can be fun and easy to teach your children the power of kindness. By teaming up with your co-parent, you can show your child that love, caring, and generosity knows no bounds. These activities are fun and rewarding ways to celebrate the holidays, and celebrate humanity.